Miss Samina Noor daughter of Rai Noor Muhammad Kharl was born on July 13, 1986 at Okara. She obtained the degree of BA(Hons) in 2010 from Lahore College for Women University, Lahore. She has been elected as Member, Provincial Assembly of Punjab in general elections 2013. A publicationcum- BA(Hons) thesis titled “Effects of Socio Economic Status on Students Achievements” published in 2010 is also to her credit. 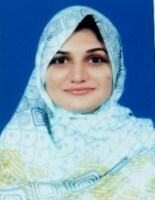 Her father remained Member of Punjab Assembly for four consecutive terms during 1985-96 and functioned as Parliamentary Secretary for Communication & Works during 1990-93; and as Advisor to Chief Minister during 1993-96; and her cousin, Rai Farooq Umer Khan Kharl served as Member, Provincial Assembly of the Punjab for two consecutive terms during 2002-07 and 2008-13 and functioned as Chairman, Standing Committee on Special Education during 2002-07. Village Khund Bohar, P.O Jaboka, Tehsil & District Okara.